Facebook is a great way to share photos with your friends and family members. There has been a huge rise in the number of photos shared on Facebook with more than 60 billion photos shared by its members already. Read some interesting facts about Facebook Photos here.Everyday we see our nears and dears sharing pictures on Facebook as albums and there are times when you want to download and store them on your machine. This is quite cumbersome a task, if you have to download each picture by right-clicking and then doing “Save Image As…” for each photo. The biggest disadvantage in this is that the photograph saved is not of the same quality as the image.Below are a few ways using which you can Download entire Facebook Photo Albums to your local machine in a few clicks. 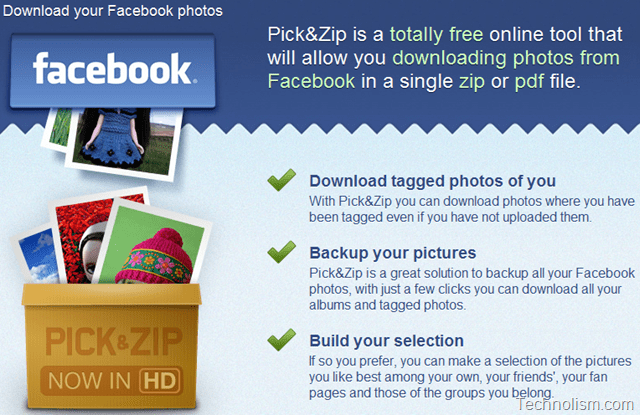 Pick&Zip is a totally free online tool that will allow you to download photos from Facebook in a single zip or pdf file. You do not have to download any software on your computer to use Pick n Zip. To start using this service, you just have to log in with Facebook. 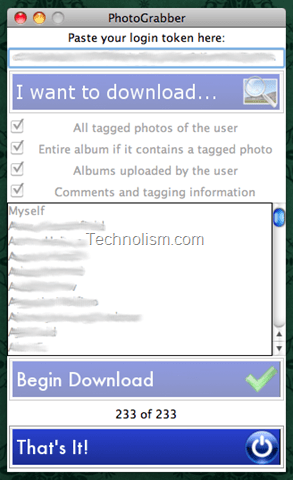 Pick n Zip allows you to download tagged photos of you and also, the albums of your friends. When you login with your Facebook login credentials, you get a list of all your friends on the left side as a list. When you click on any of your friend’s name, all the albums of that person are listed. You can download a particular photo or the entire album. Using this site, you can even download the photos from Groups or Pages. I really liked the very interactive and user friendly interface and design of this website. Give it a try (Link to Pick n Zip). If you are more of a desktop application kinds, then FotoBounce is a nice alternative for you. It is a tool to organize photos for Windows and Mac OS X which helps you to view and download photo albums from Facebook. It also has a great feature of face recognition. 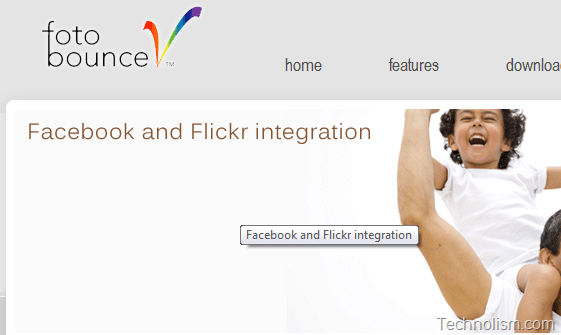 It is compatible to both Facebook and Flickr. Download FotoBounce from here. I hope that this information helps in downloading facebook albums in an easy and efficient way. How do you save your friend’s photo albums from facebook? Do share with us in the comments section below.